One of the oldest clubs and most recognisable names in women’s football, Millwall Lionesses Football Club is fiercely proud of its richly deserved reputation as a pioneering force of the British Women’s game. 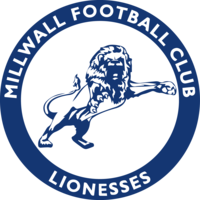 First founded in 1971, The Lionesses became the first club in the country to be officially affiliated to a professional men’s team in the 1980’s, as Millwall FC sought to strengthen their ties with the local community. With the support of the Millwall Community programme, the Lionesses quickly became a leading light in women’s football. They were the first club in the country to open a Girls Centre of Excellence, allowing them to develop talented players from the age of eight, right through to senior level. Many graduates of the Lionesses’ youth system have gone on to win honours, both on an international and domestic stage, including such legends of the women’s game as Hope Powell, Pauline Cope, Mary Phillip and Katie Chapman. Founder members of the Women’s Premier League in 1991, the club also collected its first major silverware that season, as Yvonne Baldeo netted the only goal of the game to defeat Doncaster Belles in the Women’s FA Cup. The Lionesses repeated that feat six years later, with Lou Waller’s winner securing a 1-0 victory over Wembley in the final at Upton Park. Millwall collected a domestic cup double that season, beating Everton 2-1 at Underhill to lift the Women’s Premier League Cup for the first time. After an eight year absence, the Lionesses clinched promotion back to the Premier League in 2009 and, more recently, were successful in their application to join the newly formed Women’s Super League 2 for the start of the 2014 campaign.